We’ve always been very proud of our LEGO creations, whether they are simple little houses or complicated spaceships. 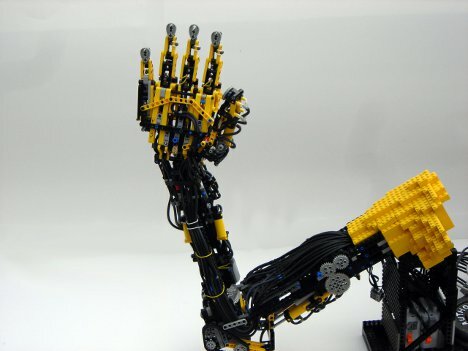 But we’ve never built anything half as cool as this robotic hand built by Max Shepherd. It was meant to display full human-like dexterity and range of motion at 1:1 scale. The hand was designed as an above-elbow prosthesis and is controlled by a cluster of joysticks and switches. It isn’t meant to be as strong as a human hand; it can only lift a couple of pounds. But with its amazing movement abilities – and the ready availability of the building materials – this is an outstanding experiment in what can be done with a lot of dedication and a relatively small budget. See more in Robotics or under Technology. February, 2012.